Coptic Orthodox congregations in Houston have joined churches worldwide in canceling today’s Christmas services as a way to mourn the victims of a suicide bombing at a church in Egypt last week and to avoid further violence by anti-Christian terrorists. In the U.S., where about 200 Coptic Orthodox congregations go relatively unknown, Egyptian-American Copts remain scared and brokenhearted on a holiday so central to their Christian faith. The New Year’s Day bombing was the worst in the country in decades, and an al-Qaeda affiliated website threatened more, encouraging attacks against Coptic churches during Christmas, which on their Alexandrian calendar falls about two weeks later than the traditional Dec. 25 holiday. With more security than usual, his congregation — made up of about 250 Coptic families — was to attend basic Nativity services Thursday night, with a liturgy lasting about five hours. 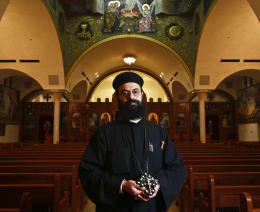 They sang Christmas hymns in Coptic, their joyful tunes sounding out over the simple cling of cymbals and a triangle. For Christmas, the congregation typically joins together for savory, indulgent potluck dinner, after a 43-day fast from meat, dairy and fruit. This year, there’s no break-the-fast gathering, no services and no festive decorations, out of respect for the church family they lost and concern for their own security. Though the FBI remains on heightened alert when there are generalized holiday threats worldwide, “we are not aware of any specific or articulable threat that targets any Coptic church or specific location in our territory,” said special agent Shauna Dunlap, with the FBI’s Houston Field Office. The Coptic Church, the largest in Egypt, belongs to the Oriental Orthodox communion, whose practices resemble Eastern Orthodoxy. It split from the Eastern and Western church in the 5th century. Shumukh-al-Islam, the Arabic website thought to be affiliated with al-Qaeda, had listed the names, pictures, addresses and phone numbers of Coptic Christians in the Middle East, Europe and Canada, including the site of the bombing in Egypt’s capital that killed 21 and injured nearly 100 more, according to the Associated Press. The threats have been enough to scare worshippers away. Though Egyptian Copts, who make up just 10 percent of the Muslim-majority nation, say their persecution is nothing new, things seem to be getting worse for Christians there and across the Middle East. “It’s been a 30-year escalation. It didn’t happen overnight,” said S. Michael Saad, the chair of the Council for Coptic Studies at Claremont Graduate University, outside Los Angeles. In L.A., 5,000 Copts protested in the streets following the recent attack, which struck the community with its intensity and proximity to Christmas. “Egyptian churches have never seemed to be on top of al-Qaeda’s agenda, but that’s reignited as a result of anti-Christian propaganda in the country,” said Aidan Clay, who works in Egypt and the Middle East with the human rights group International Christian Concern. Rumors thought to have prompted the recent attacks allege that the Coptic Church has held members against their will for trying to convert to Islam. Al-Qaeda has also threatened Christians across the spectrum, including Roman Catholics and underground Protestant churches in the region, Clay said. Muslim groups have condemned such attacks as extreme positions that do not represent their faith. “We condemn the heinous attacks on churches in Egypt and Nigeria and repudiate the apparent motive of the perpetrators to harm long-term relations between Muslims and Christians,” the Council on American-Islamic Relations said in a statement. “The best response to these cowardly attacks is to redouble efforts to build bridges of understanding between faiths. Activists, Copts and clergy are calling on the U.S. government to put pressure on Egypt — a recipient of foreign aid — to do more to protect religious freedom in the country.